This curvaceous sports car has a shape that stops bystanders in their tracks, and leaves no doubt that it is a Ferrari. With a high-strung 4.3L V-8 that cranks out 490-bhp, this exotic screams to 100 km/h (62 mph) in a claimed 4.0 seconds, and continues on to a top speed over 196 mph. The V-8 can be harnessed to a conventional 6-speed manual, or the optional 6-speed F1 electronically actuated gearbox. Non-USA cars equipped with the F1 gearbox get a Launch Control feature that consistently ensures maximum acceleration from a standstill. A standard E-Diff electronically controlled limited-slip differential reduces wheel spin, for enhanced traction and handling in a variety of road conditions. 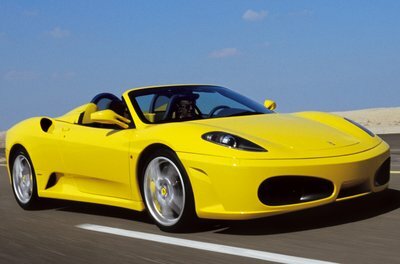 Ferrari has designed the F430 as its interpretation of an uncompromised sports car at a relatively "affordable" price. Unfortunately, only few prosperous customers will get to experience the thrill of ownership.